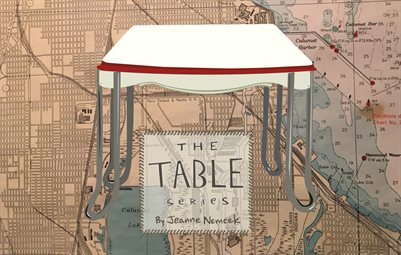 It began with a beautiful red and white enamel table that I discovered while combing through the contents of my uncle’s house on the southeast side of the city. Intrigued by a hope chest of mementos and a time capsule of household appliances I developed The Table Series, a collection of still lifes and snippets of conversations I imagine one table has overheard in it's lifetime. Like eavesdropping itself there is always more to each story and much is implied. This small graphic novel includes 20 pages of original drawings with unique hand lettering.